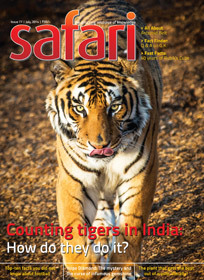 March 2014 issue of Science and knowledge magazine – Safari – hit the market a few days ago. We however able to complete reading the same a few hours ago and here are our personal, informative reviews for the same. 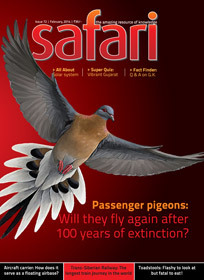 This issue talks about Skyscrapers and hence we see them on the cover page. It (cover page) gives glance of a stock market related magazine due to this. Editorial is not found in this magazine (so far) which is quite a downside of the same, as per our point of view. When talking about weight-lifting champions, we vision heavy weight fellow. We sometimes have a question in our mind that if we consider all the living species, which one is the strongest in the same aspect. We think of mammoth elephant or whale or similar creature, right?! But, when considering the ratio of the weight of the animal and its capacity to lift weight, we found some interesting and unbelievable answers. To know who is the weight-lifting champion of the animal world, you can find a small yet informative article on page 6 of this issue. There is also an interesting small article about the Elephant cave made by salt-mining elephants in Kenya. X-ray is quite a common word these days, but we may not know how it was discovered. A small article about the same is quite interesting. 5 facts about Great Whale Shark – is a different kind of approach (photo-informative article) to provide factual information about the same. It gives you feel of a discovery magazine’s – under the sea – stuff. Good to read once. When studying we heard about – the Dead Sea. We found at very interesting since than. Due to the composition of water in the same, one can easily float on the same, effortlessly! Do you think there is anything else we can talk about it? There is a 5 page article talking about scientific facts and historical stuff about the dead sea. The article is something not to miss. Being academically substandard student, Albert Einstein had failed to clear matriculation examination. Luxury Trans-Atlantic liner Titanic was considered ‘unsinkable’ at the onset of its maiden voyage in 1912. Ostrich buries its head in the sand when fearing attack by a predator. The Atacama Desert has the driest climate in the world because some of its areas have not experienced rainfall in the last 400 years. The theory of ‘survival of the fittest’ was propounded by Charles Darwin, the originator of Evolutionism. There are some supplementary information about other myths mentioned in the article as well. The article is added with photos to make the point more clear. For example, the discussion about Albert Einstein is embedded with a copy of his school mark-sheet! One of the must read article of this issue. 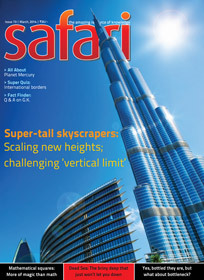 Then comes the themed article of the issue, an article about – Skyscrapers. It the article was a collection of various numbers it could have been a boring read. But the facts are weaved in interesting way that you actually enjoy reading the article. There are some illustration and photographs makes the article more eye catcher. Reserve Bank of India have passed a circular to pull back the currency notes which were printed before year 2005. Earlier the time limit to exchange the old currency notes was set to 31 March 2014 (afterwards they could be exchanged at a bank only); which was recently extended. Fighting against fake currency is one of the biggest problem any country face. And that is why more and more security features are added to currency notes over the period of time. Naturally, the bigger the amount of the currency note, the more security features it should be armed with. Fast Facts – segment of this issue talks about the same and brings some historical information about various currency notes printed. This article should be read by everyone. Student shy away from Math consider it as boring subject. Of course, it is tough at the advance level. But it is interesting as well. There are various ways to have fun with it. One such fun people make with maths is, playing with Mathematical squares. And this mathematical (or should we say mathe-magical) squares and its history doesn’t belong to the modern time only! The roots of same are found in time of centuries ago! It is actually a very logical and scientific approach to the Maths, which makes it interesting. It is the article you suggest to read to those who are keeping distance from Mathematics. We use bottleneck word in our life to represent the problem where the things are stuck at a point and seeing no way to move ahead. But we see transparent glass bottles at various places which contains the objects inside, which we think are not possible to fill in – because of the small mouth or neck of the bottle. A famous tale about filling a watermelon or sugar-melon in such a pot was found in wisdom tales as well. There is an article about such stuff found in bottle and how could it be filled in. A very interesting article. Why the hair of the eyebrow, eyelid or hand does not grow as much as the hair on the scalp? Why do clouds float in the sky even though they have thousands of tonnes of water in them? Which is the heaviest man made satellite ever launched? What is its size and weight? What type of lighting is used to illuminate cricket or football ground for night matches? Why does our finger nails grow faster than the toe nails? How did the custom of salute begin in the military services? Which is more – The number of people who have died so far or the number of people alive today? When was mobile phone launched in India and who was the first person to use it? The super quiz section of this month is focused on – International borders of the world. There is very detailed article about Mercury bringing all the information you need to know about it. Overall the issue is worth reading. It gives you the best for the money and time you spent to read it. Our personal verdict is – just go for it.